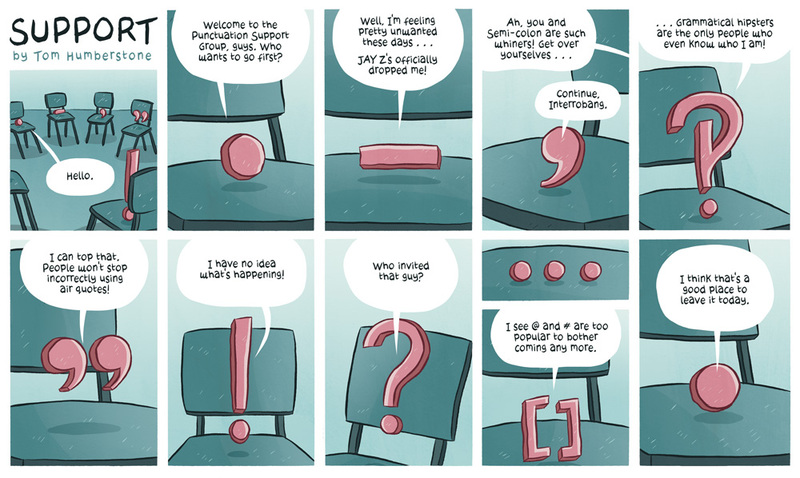 I love Exclamation Mark’s happy bafflement, and the last two frames tie the strip together very nicely (though for comic timing and pathos I’d have put the ellipsis between them rather than before them). I don’t think I have anything to say about the Jay Z hyphen non-story – but if you do, I’m all ears. You can see more of the artist’s work at the New Statesman and on Humberstone’s own website. I’ve decided since I’ve barely any time to post original content of late, why don’t I ask for help, who wants to yell some nonsense at a small crowd of echo fans. Currently at 50 subscribers, give a comment and I’ll try to work things out with you if you’re at all interested. No need to be shy I don’t bite. Well, I won’t bite you. Well I’m back with another wacky and exciting post. Lets start with updates! Currently looking for guest bloggers, because why not. Currently creating youtube videos, feel fee to suggest old games fire me to play, preferably super nintendo and of low difficulty, as I often fail. As for ongoing series, my latest segment on the kingdom of harmony has been delayed as I can’t write phrase it right, but out is mostly complete and will most likely be out by sunday, I haven’t done much with my off line books of late so I intend to continue that, and possibly post an excerpt or trip from wolfbite. In other news being broke and honored is hard work, but I got to go hiking with my friend Karma last sunday, so that was fun. Anyways that’s what goes on with the madman with a pen, what about you lot? The clouds thick as they were did little to impede the harsh sun, leaving the world dark and hot, the worst of both worlds. He walked a slow trot through the dead crops, his home a dried wasteland once refers to as paradise. Truly he felt cursed by the gods, neither reason nor light nor the cool breeze to make his task seem less daunting. Suffering had been ask he had known for ten months, and all for trying to show kindness, Dave learned his lesson, the next time someone asked for his help he would surely turn them down without remorse save for anyone marked by the deities themselves. He continued until he reached the small psych of land he was able to sustain through the unnatural drought, just enough to keep himself fed, and by no mean well fed, just fed. Dave had once green a kind man with plenty but as he struggled to start alive he scarcely could recall the splendors his land once afforded him. Life was merely pain and the promise of future pain, though death seemed like even more poison within his mind, it even began hurting just to eat. The concept of poison became meaningless against this backdrop as there was nothing with which to compare. Hey, I’m doing youtube stuff, isn’t that unheeding? I’m not done writing posts this is just an easy thing so it’s done more often, but I promise you, Project Echoshadow is never done writing. City Kids and Country Chickens. When I’m feeling it doesn’t always manifest as pure writer’s block more often I merely feel boredom and no urge to write. In fact I’ve been about to break free by forcing myself to write, though usually I simply ignore my creations in favor of other people’s work or something unrelated to the written word, such as my love of video games, or that job search my family doesn’t believe I’m actually doing. When I feel uninspired the logic in my mind is this, I simply don’t feel like writing at this moment. So most of the time I simply do not when this mental state occurs, there are so many things to do inspiration always truths no need to chase after it. When inspiration takes a break so do I.